For example, right now is the best time to go to the Caribbean, before the rush of Spring Breakers flock for warm weather cruises. Travel + Leisure has a great explanation, which you can check out here. If you are interested in taking a cruise out of the Manhattan Cruise Terminal, you have two options, both with the Norwegian Cruise Lines (NCL): the Norwegian Gem Cruise and the Norwegian Breakaway Cruise. These are the only two options that go out of Manhattan and return to Manhattan until June, when the Carnival Cruise Line comes to the Manhattan Cruise Terminal. 3. Book your parking ahead of time. Because parking at the terminal can be a bit tricky, not to mention expensive, on the day of, it is wise to reserve ahead. 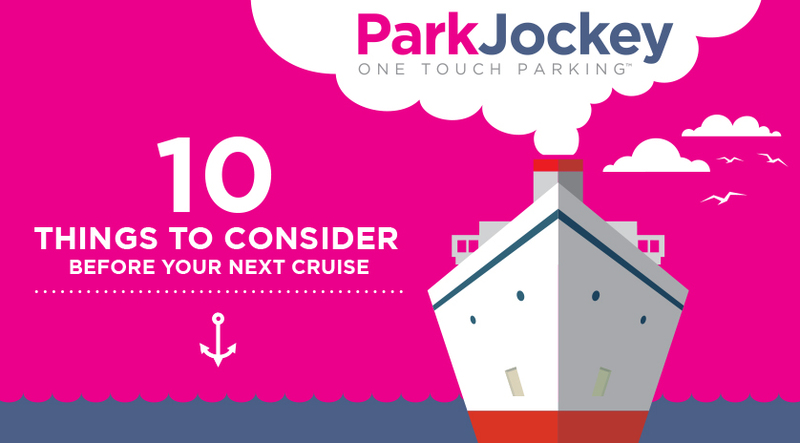 You can reserve ahead through ParkJockey here. Make sure to enter the promo code CRUISING to save $5 off of your booking! According to this article, you can really save a lot of money on last-minute cruises. Speaking from personal experience, if you are a retiree and are interested in Viking River Cruises, advertised on PBS during every episode of Downton Abbey, then there are a couple of tricks to get major discounts. You can really save when they have a boat that has a couple of cabins that haven’t sold, you can get a great deal by calling them up and seeing what’s available within four weeks. Alternatively, if you’ve already been on a Viking River Cruise, you can ask to be put in the “Viking Explorer Society” and get great deals. Lastly, if you book your next cruise while on board a cruise ship, you can experience major savings for your next trip. I’ve long been a supporter of using credit card points to redeem for travel. Having redeemed mileage points for flights from Washington, DC. to New Zealand, Australia, New Caledonia, and Singapore for a grand total of $300 in taxes, using points for free travel is a bit of a hobby of mine, and the cruise industry is no exception. Like airlines and hotels, cruise lines have co-branded credit cards. The Carnival Cruise Card is restricted to cruises and on-board expenses with Carnival. There are other offerings which might be more worthwhile, not being restricted to cruises, but redeemable for cruises as well as other cruise-related expenses such as airline tickets, hotel rooms, and car rentals. One such card is the Barclaycard Arrival, which will let you redeem at 1 cent per point for travel expenses. According to the Points Guy, the Barclaycard Arrival offers 2 miles per $1 on all purchases and then you can redeem them at 1 cent apiece and get a 10% miles refund on travel redemptions. Another great example is the Chase Sapphire Preferred, which offers 2X points on all travel, including cruises, but also airlines, hotels, car rentals, etc., and whose points redeem normally for 1.25 cents (which means you can redeem 40,000 points for a $500 cruise) or for specfic cruises at 1 cent a piece. Amex Cruises also enables you to book a cruise and pay with an American Express Platinum Card. They have a program called Cruise Privilege perks, which include stateroom credits, upgrades, and onboard amenities. According to the Points Guy, You can book a cruise directly through the website for a redemption rate of 1 cent per point. In other words, a $500 cruise will cost you 50,000 Membership Rewards points. Airlines such as United and American Airlines have joined the cruise business (United Cruises and American Airlines Cruises), and you can earn airline miles on each cruise. You can even get triple the miles for balconies and suites! 7. Hire an agent to secure a good deal. According to Budget Travel, agents have access to much better deals that we do. In fact, each cruise line employs specialists who can offer discounted fares. You can learn more about that here. Apparently, there are cruise auctions as well that have bargains 90 days or less before sailing. Vacation To Go has a “90-day ticker” and Sky Auction has cruise auctions as well. 10. Know the dress code. Each ship has a different dress code depending on whether it’s high-end or more casual. Either way, you need to make sure you know what to wear to dress appropriately for the elegant dinners aboard cruise lines. Just in case, according to the Cruise Critic, one is able to rent tuxes on the luxury liners. Enjoy the great savings! I hope this helps some of you on your next cruise! This entry was posted in Miami, New York, ParkJockey and tagged cruise, cruises, manhattan cruise terminal, miami cruise port, parking, parkjockey, port everglades, port everglades parking, port miami, port miami parking on January 27, 2015 by ParkJockey Team.